Part holding fixtures produced in a variety of materials, in any quantity required. Used with thin steel or photopolymer plates. 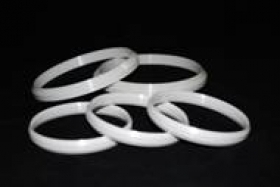 Double sided ceramic rings last twice as long as single sided rings. Can be easily flipped over and extend thin steel and polymer plate life. Available in any length, height and thickness. Used to mix ink and auxiliaries prior to printing. Spill free, safe way to add solvents to ink mixture. Eliminates spillage which occurs when pouring solvents from large containers. Formulated to effectively dissolve and remove printing inks from screen printing mesh, squeegees, flood bars, pad printing plates and presses.